The big snow missed us this time. We got a handful of inches. But first we got wet stuff, which promptly froze under the snow. My ride to work was on a five-mile sheet of ice. I went extra slow and I rode the heavy bike, the bakfiets. I wanted to see how it would do. After the first corner, the rear tire skidded out from underneath me, but I caught myself right away. A skid like that on my Raliegh and I would have been on the ground. But the bakfiets has a highly sloped seat tube, which puts the rider in a position to put a foot down without any effort. I didn’t even have to think about it. I’d instinctively put my foot out and the bike didn’t tilt over much before I was standing. The rest of the ride was purposefully slower and nearly traffic-free. I left extra early to give myself time, so the combination of that and the bad roads kept the cars away. By the afternoon, everything on the roads had melted and my ride home was uneventful. Later, I went over my mother-in-law’s to shovel her drive and walk. Here is where the bakfiets takes the place of a car. I needed to bring our snow shovel. I would have spent far too long considering how I could bungee it to the rack of my Raleigh, if I could at all. 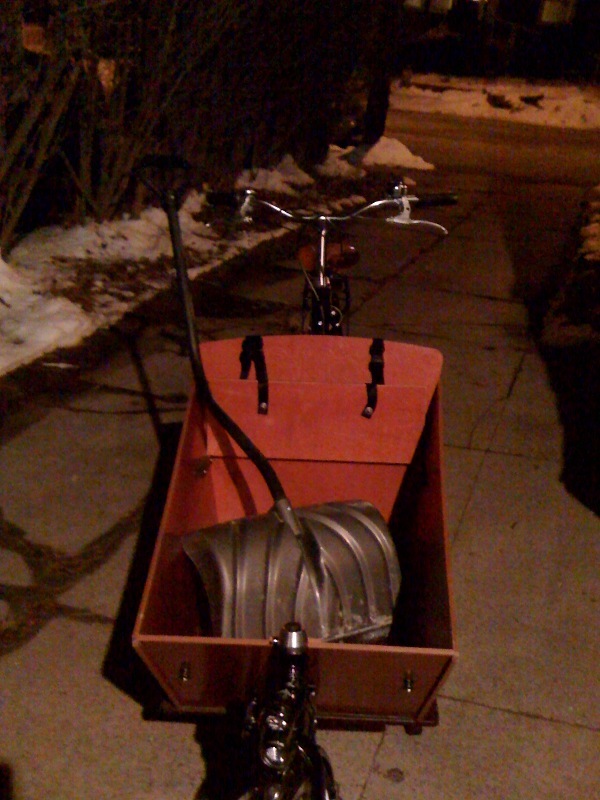 But with the bakfiets, I put it in the box and I leave. That’s it. Just like a car—you don’t think about how the shovel will come with you, you simply put the shovel in and you go. It’s the ease that makes it work. Bikes should not be hard. You also get past scraping up the box and dinging the paint. This is a bike meant to work and sit outside all year in the salty air. As Henry Cutler has said, they’re “not spring flowers.” I used to be pretty fussy about my bikes, but all I do anymore is clean the salt off my Raleigh when winter is over and wipe my chains when they get too gritty. They don’t need much more than that. This bike needs even less.